Ex-1960s Gasser Chevy is now prowling the streets of Southern, ON. 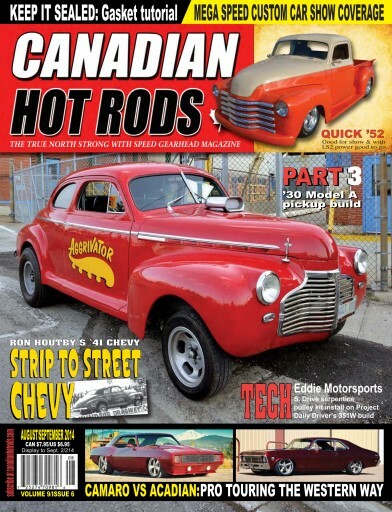 Coverage of Canada's largest indoor hot rod show..Toronto's Mega Speed Custom Car show. Pro Touring Chevys featured include a 1969 Camara RS/SS and a rare 1968 Acadian SS car. 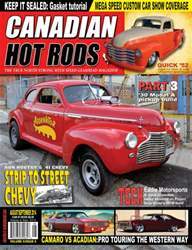 Tech features include Part 3 of Marty Mayer's (The Bodyman columnist) 1930 Model A pickup build. Also, we install an Eddie Motorsports S.drive serpentine pulley kit on the 351W in our Project Daily Driver 1965 Ford Country Sedan wagon. Also, Dave York's beautiful barn find Deuce roadster.